When I was growing up, there were two kinds of families. Those that had baked beans and those who didn't have baked beans. We were one of those families who didn't have them. I don't know why. I suspect it just was something Dad didn't like to make or Mom didn't have a taste for. I grew up like a typical kid thinking they were gross and that you'd walk down the street with your back end doing a motorboat impression. It was easily in my 20s before I even had a dish of them and probably in my 30s before they were made in my kitchen. I blame Mildred for that. Mildred is Kevin's mom. Great woman. Fascinating person. She was a teacher in a school in Chester County, PA. One of those people who made cakes from scratch, could make a roast that would melt in your mouth, and made a proper meal without even thinking about it with nothing "prepared". She was a baked beans kind of person. I'm glad of that. 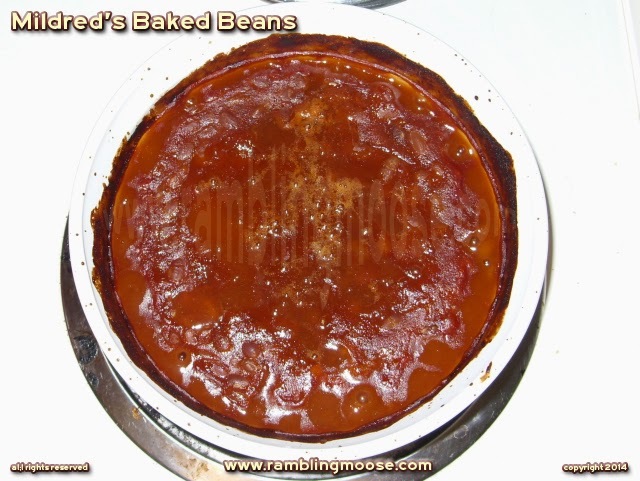 Because I have never had a recipe for baked beans that was anywhere near as good as these are. They are sweet and savory at the same time. Very lightly spicy but not hot, almost a little peppery. Oh and no motorboating down the block. I know because we made Mildred's Recipe this weekend. Her original recipe is followed fairly faithfully, but I did discover a very simple improvement in the way you do this - stir them when you take the cover off. It's very important because it helps the spices mix with the actual sauce and the beans. Really, don't forget. It's a minor thing but it improves the flavor greatly! 2 cans 16 to 18 ounces each of Vegetarian Baked Beans. We prefer Heinz. 4 Tablespoons of Dark Brown Sugar. 1/2 teaspoon of dry mustard powder. coat inside of 1 1/2 quart casserole dish with olive oil so the beans don't stick. mix ingredients in casserole dish and put lid on. uncover the dish and stir. bake uncovered for one additional hour. Guaranteed to be "nifty". I can vouch for it!